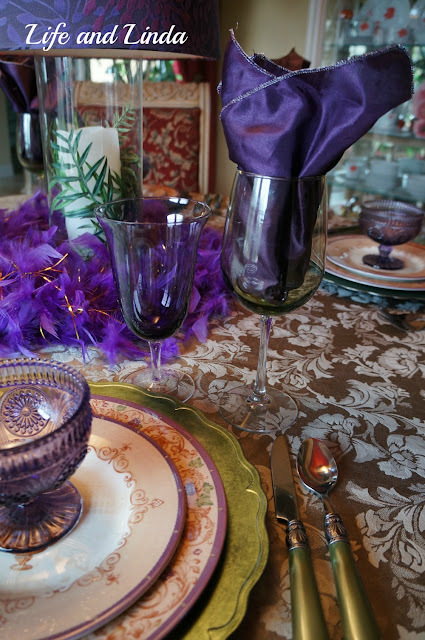 With Christmas gone and all of my gold and red decorations put away, I thought it would be fun to create a pretty table with purples and greens. The only thing about this theme is, I set it up in our red and gold breakfast room. Bear with me and try to focus on the purple and green. The flatware is from Ross. Green chargers from Michaels. The green goblets are a Dollar store find. The centerpiece is a clear tall cylinder. I added a white candle with greenery. I topped it off with a colorful lamp shade. The lamp shade is from Ross. The purple boa is from a costume I wore. A great tip for a centerpiece is to use a glass cylinder. I like to top it off with a lamp shade. Add a candle or two, greenery, potpourri, jewels, or water gems with an led light. I created this one below for a wedding, along with the candy buffet. The plates I bought at an exchange party. The purple napkins I found at Z Gallerie. Enjoy the rest of your week and stay warm and cozy. I have never seen a purple table setting before - beautiful. Looks very Mardi Gras! Good work. Great job! looks like you are ready for a small little dinner party!! love the color combo! love the frills! Linda, this is so pretty! I love the colors. I agree with Ron...it would be perfect for Mardi Gras! Hi Linda, this is so beautiful tablescape. Love keeping in touch! Thank you for the "over the top" compliment on my Winter Mantel...it is much appreciated. I love the purple and green color scheme. It reminds me of my grandmother's amethyst collection. And your flatware goes so perfectly. Great find with those glasses...nice job, baby! Love the fun color on this table! The centerpiece is cute! That cylinder dressed out with the boa and the lampshade is cute! I'm digging on those plates and the hobnail compotes! It is nice to see some new coloring after Christmas! 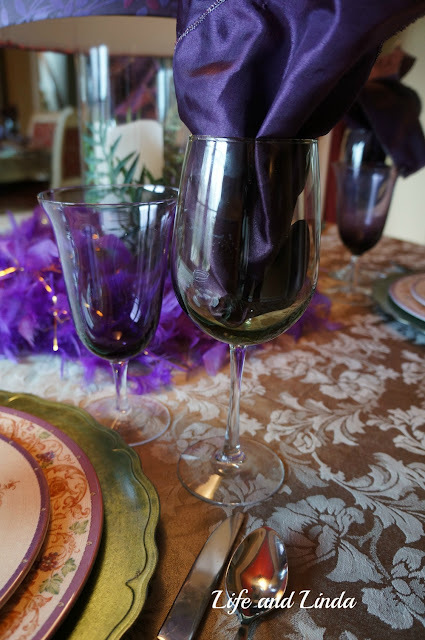 Love the pretty napkins and the stemware too! 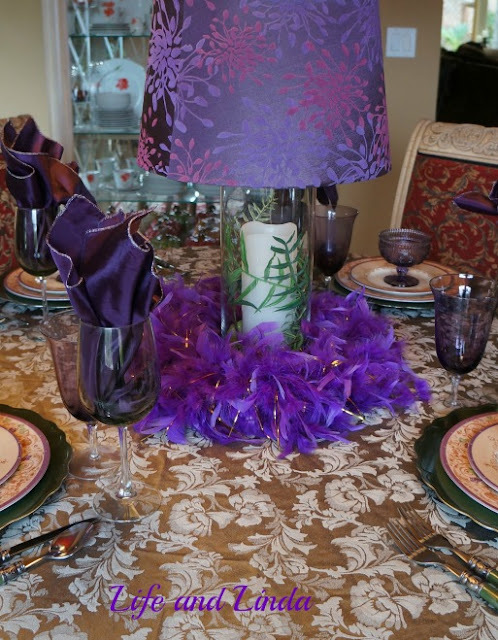 What a beautiful tablescape in purple and green! I'm very partial to purple (Purple Hues and Me Blog) and green is also one of my favorite colors. You could keep this up through St. Patrick's Day and also Mardi Gras! It's so versatile!!! I love these colors together, they are used for Mardi Gras, too. 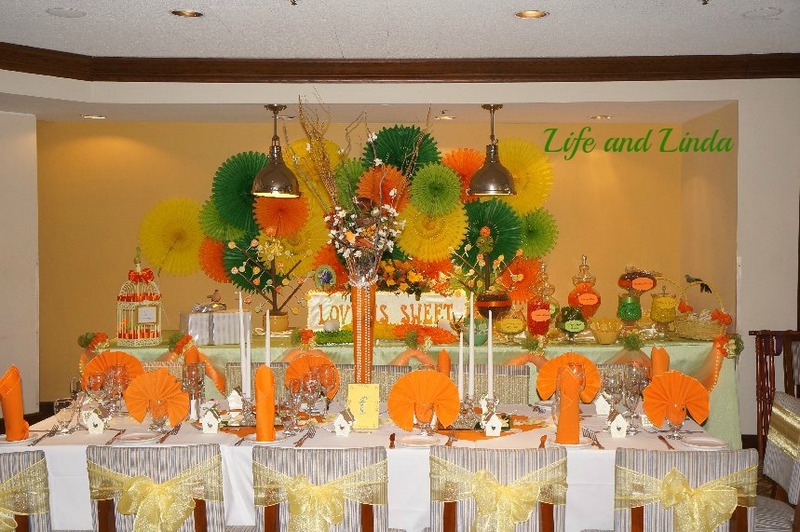 You could throw a fabulous themed party! Please invite me if you do! I love this color combo.....also love your new header and set up!!! Thanks for sharing where you purchased everything. It all looks incredibly classy and vibrant. Great colour combo! 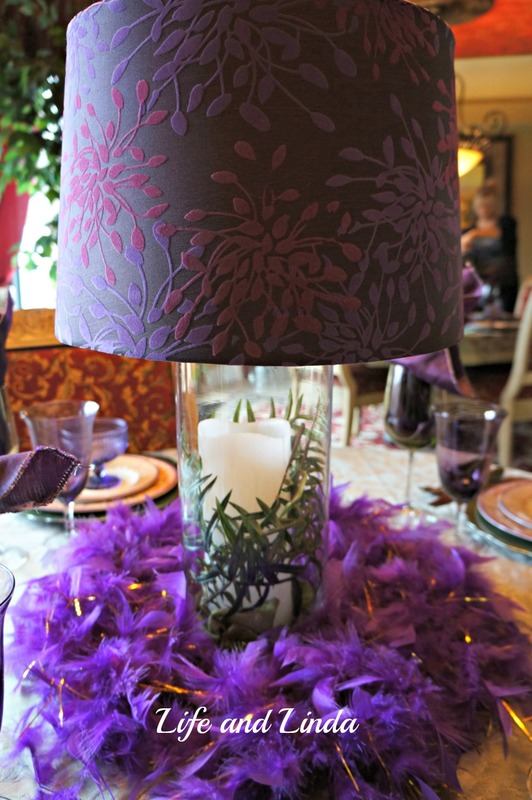 I espec like the use of the cylinder vase with the lampshade as a centerpiece - looks so pretty! Very pretty! I love the hobnail dessert bowls! LOVE it ! and purple and red look good together, looks good with orange too , heck purple is the new neutral LOL. Thank you so much for dropping by my blog and thank you for your sweet words. I'm glad to have you on my list now, and I am proudly your 500th follower. You're such a talented women and your blog is spectacular, also I love your table setting in the dark lavender. Hi Linda, what a nice surprise to find that you visited my blog and followed me. I am very glad to have found your beautiful blog. I have fallen in love with purple this year and love them mixed with the green. And the lampshade on the glass cylinder is such a great idea to change the look of it. I'm sure the glow from a candle or even battery candle would be so pretty. Thank you for you nice comment at my place! 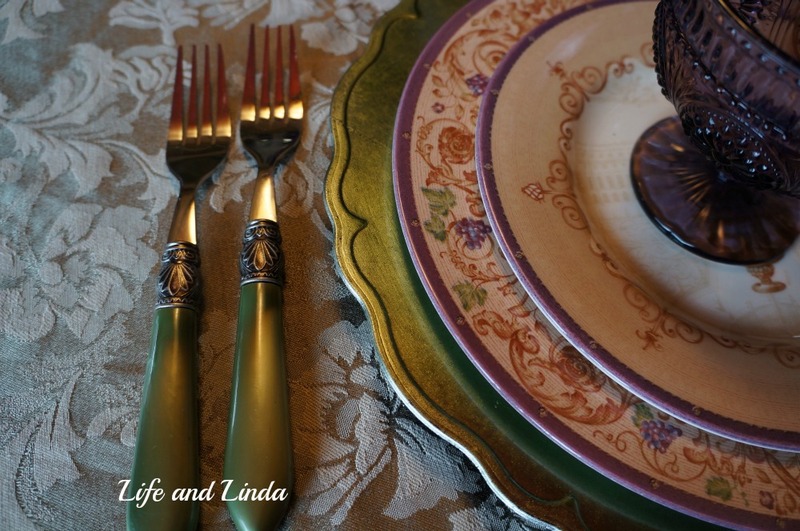 I love purple and green, so I think your tablescape is lovely! 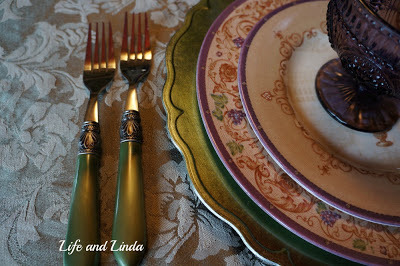 I really like your centerpiece, the green silverware and the hobnail dessert glasses--very pretty! Hi Linda! Love the purple and green! So festive and bright to lighten up dreary days! Love the wedding reception tables too! Blessings from Bama! Hi Linda, I love the green and purple together. How clever to use a lampshade on top of the cylinder. The boa is perfect! I've seen those goblets at my $ Tree and am thinking about buying them. However, my Ross sure doesn't have that pretty flatware. I have the green goblets from the Dollar Tree, and never thought to tuck a purple napkin in them. Love all the colors you used together! Hi! So nice meeting you! I'm sorry to be so late replying, we were out of town all day, just returned! Love your purple and green tablescape! Lots of neat ideas here! I am chuckling because so many of us are anticipating spring with our tables this week and winter has just begun for most! Your green and purple table is gorgeous. I like your idea of using a cylinder with shade for the centerpiece...you may be seeing that on one of my future tables! I love this, so different and unique, I love purple and the boa...Priceless! Beautiful colors. This table would be perfect for Mardi Gras. Thanks for sharing. Talk about different! I've never seen these colours used in a tablescape, but what a wow!! Looks wonderful! I like your table setting. It's a nice deviation from the Christmas colors you probably had in here and were ready to change. This table setting reminds me of Mardi Gras. Don't they celebrate that this month? 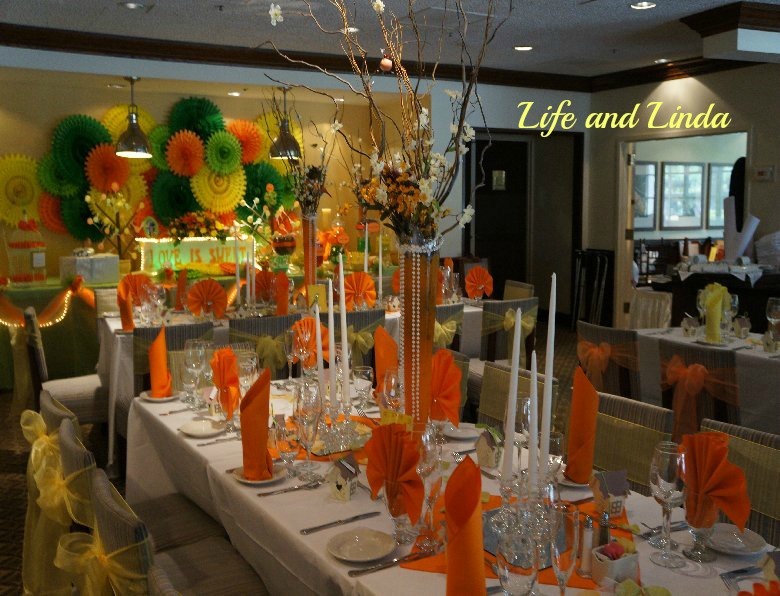 Such a beautiful table setting, the mix of different colours is so refreshing @ this time of year! I luv green & purple! So elegant. 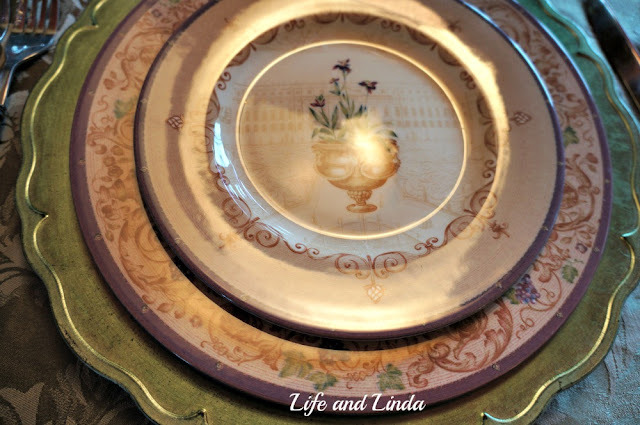 Linda, you have such a flair for doing the unexpected! Gorgeous color combination that I never would have thought of. Your whole house reflects your pizazz & love of color & design. I love every inch of it!! I've gotten all your posts this year via email & enjoyed each & every one. You do have a knack for this!! Thank you for sharing your beautiful home & creative ideas. Warm hugs 'cus I saw CA got snow! Nice to meet you here in the blogosphere! Your table setting in purple/green is absolutely gorgeous. Very warm and inviting. You obviously have a flair for decorating. I am following you also - looking forward to more of your wonderful posts! Beautiful table and so cheerful! Looking forward to more of Life and Linda. I love seeing all the bright colors on your table. Purple seems to be one of those colors most people forget about these days, but it's very pretty. I think about my childhood piano teacher's daughter every time I see it because she wanted everything around her purple. A former neighbor had her whole house purple too. I love your pretty dessert compotes and your creative ideas for a centerpiece. I decided to come back to my blog a week or two ago, so I'd love to have you drop by whenever you get the chance! Lové That you graced your beauty over at my place, better that I return to see settings the beautify a setting with rich relaxed elegance. Love the Mackenzie child feel to the plates. They are plate settings to love. Will visit real soon, looking to you for more inspiring beauty. Thanks Linda for linking with my Make My Saturday Sweet! I see you've changed your header. Nice job! I clicked on your link on my hop, because I wanted to see the green and purple. I love colors and they sounded like a great combo. You've done a lovely job. You look like you have lots of fun with your creations! Thanks so much for your kindly visit and lovely comment,you made me so happy. Thanks as well became my follower,me too happy to follow you. 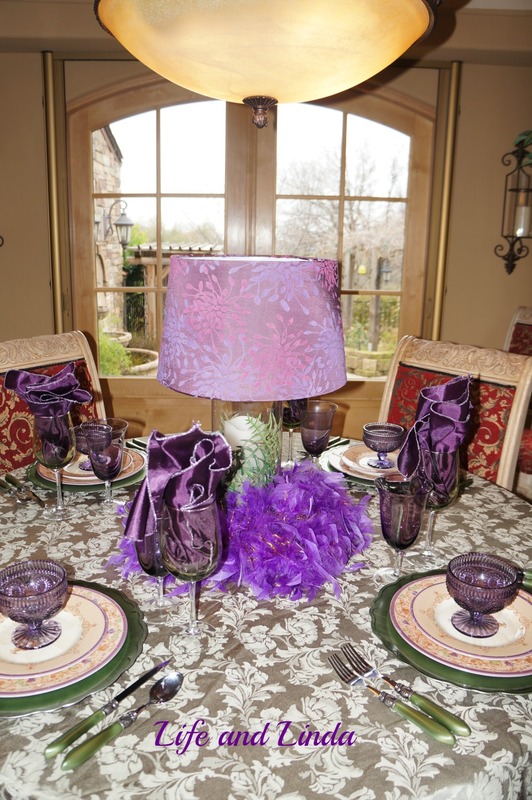 wow, so beautiful table set-up purple with green such a perfect matching colors. I fall in love with your purple lamp shade ;). What a great use of color! So cheerful, just what I need. Thank you so much for your prayers for my dad and his heart! 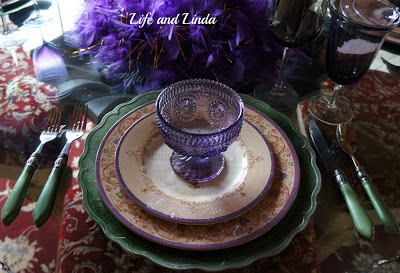 Linda, I love the purple and green combo. Adding the lampshade to they cylinder was a clever idea. Love, love thos hobnail compotes! Thanks for sharing with Share Your Cup. So pretty! Purple and green is great for Mardi Gras too! purple has never been so beautiful! I've heard of those exchange parties, but I have never known of one around this area to participate in. That would be so much fun, and it makes a lot of sense!!! It's a way to give away stuff that you are tired of and get something that someone else has grown weary of looking at! Hmmmm...I need to try to get one of those parties going here!!! This is a table that would work out great for a lot of occasions including Mardi Gras with all the purple & green and the feather boa!!! I love the hobnail dessert compotes. I have seen those at T.J. Maxx/Home Goods, and I wanted them so bad in all the colors!!! I remember that decor from the wedding you decorated!!!!! It was so colorful, and I loved the collage you did on the wall!